Outhouse Rag: Stacked the Most Complete and Challenging Poker Game Available. Period. Stacked the Most Complete and Challenging Poker Game Available. Period. 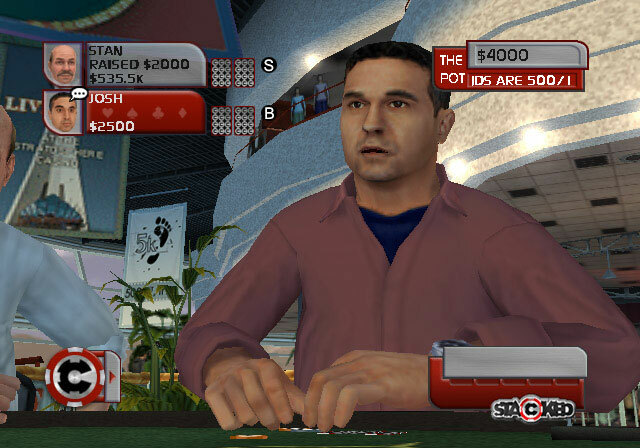 Looking for the premiere Texas Hold ‘Em video game to come out for XBox, PC, PS2, and PSP? 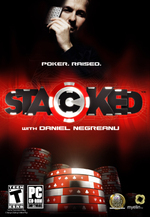 Then Stacked with Daniel Negreanu is for you! Stacked Poker features some of the biggest names on the poker circuit today like Josh Arieh, Jennifer Harman, Erick Lindgren, Juan Carlos Mortensen, Evelyn Ng, David Williams and Daniel Negreanu himself, each with a custom AI bot that matches their real-world play style. This AI bot is an exclusively licensed Artificial Intelligence system that adapts to your playing style in real-time, developed from over ten years of university research in game theory, machine learning, and opponent modeling. As you progress through the game, the AI will become more advanced, as it builds a profile of your weaknesses and attempts to exploit them, helping you learn and become a better overall poker player. Plus if you need some additional help you can access the game’s Poker School mode at any time to learn from nearly an hour of video tips and strategies from Daniel Negreanu, covering all aspects of the game from basic rules to advanced strategies for tournament success. Thanks for the review. On my way to buy this game. how cool is this game. you can learn alot from this game. Quite interested in this, will have to give it a go.